"Hey, that ho's slept with half of the guys in the Bureau. I don't know why she's saying it's mine." SHEMAR MOORE'S PARADISE has selected a winner in their first weekly CAPTION THIS contest. PARADISE began a new feature this month. Just for fun, members are asked to caption a photo posted in THE LOUNGE each Monday. At the end of the week, the Moderators select the best, funniest, or most original caption. That member is then featured on the board. This week's bragging rights belong to Dimack, aka Diana Mack, for her very funny entry. A new picture has been posted. Everyone is invited to join in the fun and try their hand at captioning. 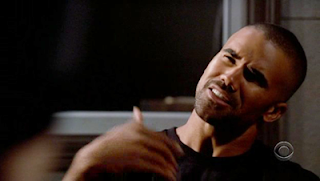 SHEMAR? Best Lead Soap Actor of the Decade?